Good Behavior is simultaneously the definitive collection of Letty Dobesh stories by Blake Crouch and no longer the definitive story of Letty herself. These stories were originally published as three separate novellas over the course of a few years. As of 2016, they are also the basis for a TNT series starring Michelle Dockery in her first post-Downton role in an ongoing series. This volume collects the stories along with author commentary. 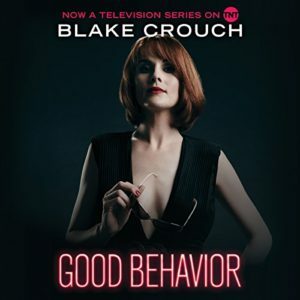 However, unlike other book adaptations, I think I might recommend watching the show before reading Good Behavior. These stories read a hell of a lot like the rough draft of the show, and might best be appreciated with that in mind. Crouch’s commentaries reinforce this impression. He discusses how he and the show’s co-creator adapted and cannibalized each story for the show, and it’s obvious that he thinks the adaptation is an improvement. He points out more than once how the stories as written didn’t match the tone of the show or how tweaking events and characters for the adaptation opened things up in new and exciting ways. As I listened to the audiobook, I oftentimes found myself thinking “Letty wouldn’t do that” or “this isn’t a Letty story”. Michelle Dockery’s portrayal is so compelling that I couldn’t picture the character any other way. 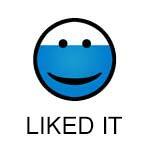 That said, I did enjoy reading Good Behavior. That’s especially surprising after I gave up on Crouch’s Wayward Pines trilogy after two books. I just couldn’t work up the energy to care about the finale, and I barely enjoyed the second book. It helps that Letty is a much more interesting and likable protagonist than the main character in Wayward Pines, who spends most of his time hitting his head and blacking out. Also, it felt like Crouch had a better handle on style and language in these stories. He pulls off a few clever turns of phrase here and there that add a nice noir flavor. Ultimately, I do recommend picking up Good Behavior, but only as supplemental material for the show and not a true standalone work. In fact, this collection is entertaining enough that I’m willing to give Crouch another chance, especially since he had a hand in writing the show. Full disclosure: I received a free review copy of this book from NetGalley, but I listened to the audiobook version. 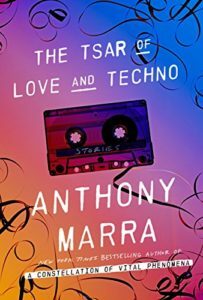 The Tsar of Love and Techno is a hilarious and affecting novel masquerading as a short story collection. It has a lot in common with David Mitchell’s genre-hopping patchwork masterpieces, but here the linked stories don’t feel so much like a stylistic exercise (and I say that as a huge fan of Mitchell’s work). Instead, Marra uses a fairly consistent style throughout, and the shifts in perspective serve more to reframe familiar characters and situations in a new light. The only real stylistic flourish is the collective narrator in “Granddaughters”, but the conceit is never distracting. It definitely helps that The Tsar of Love and Techno has a great title and an eye-catching cover, because the summary sounds a lot like an Important Novel About Sad Europeans. Luckily, it’s actually laugh-out-loud funny and full of sharply drawn characters who are simultaneously comical, ruthless, tragic and sympathetic. The first story takes place in 1937 and focuses on a government censor who modifies photos and paintings to remove dissidents and insert party officials. One of the paintings he modifies – an unremarkable hillside somewhere in Chechnya – becomes far more significant with each story, eventually serving as the through-line that ties the book together. One of my most favorite parts of this book is the way that Marra parcels out revelations and undermines expectations. The truth is mutable, and memory is suspect, but with the benefit of a novel’s roving eye, we discover the sympathetic hearts hidden in villains and the histories thought lost to time. The book feels so authentic that I had to check the author’s Wikipedia page to find out if he was born in the region. It turns out that he’s actually an American obsessed with Chechnya. It makes me wonder if people in Chechnya read his books and if Marra even has a publisher in the region. In any case, I loved this book, and I can’t recommend it enough. 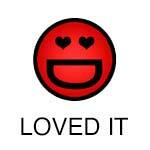 The Tsar of Love and Techno was an absolute revelation, and I’m glad I decided to pick it up. I’d like to talk about two short stories I read this week: one I loved, and one I found absolutely revolting. 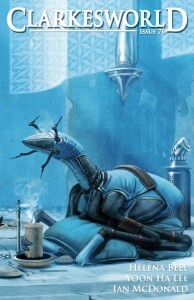 The first, Driftings by Ian McDonald, is available in the January issue of Clarkesworld Magazine. I own The Dervish House – a 2011 Hugo nominee for Best Novel – but haven’t read it yet, so this was my first exposure to McDonald’s writing. Ocean cold was beginning to infiltrate the wetsuit but the slump of a wave, the side-slip of a gull on the air, the sudden hiss of eddying drizzle; all said stay, speak. Driftings tells the story of an artist who lives in a seaside town and spends his time scavenging the shore for items washed away during the Japanese tsunami. He takes what he finds and builds bizarre sculptures in his house, which is almost entirely full of the sea’s detritus. One day he meets a mysterious girl… and I don’t want to say too much more than that. The pleasure of the story rests in its simplicity, in the slow creeping otherworldliness that builds one paragraph at a time. McDonald doesn’t provide any kind of pat explanations for what is going on, and the ending throws a nice little curveball. Highly recommended. 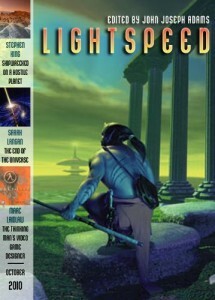 On the other end of the spectrum is The Taste of Starlight by John R. Fultz, which is included in the print and audio versions of Lightspeed: Year One. I’ve been listening to the audiobook version on and off for a few weeks now, and most of the stories so far have been pretty decent, with a few standouts like the Catherynne M. Valente story I discussed last week. I’ve found something to like about pretty much every Lightspeed story I’ve ever read or listened to, but there had to eventually be an exception, and this was it. It has certainly stuck with me, but not in a good way. The Taste of Starlight tells the story of a doctor on a seven-year interstellar mission to a far-off colony. A systems malfunction causes his cryopod to open early, and he becomes the only person awake on the ship with more than a year left to go before landfall. He discovers that there aren’t enough emergency rations to last him for the whole trip… and I’m sure you’ve figured out where this is going. I don’t remember exactly when I started guessing that he would resort to cannibalism, but it was definitely telegraphed pretty early on. Sure, the main character eats all the emergency rations first and does his best to live without food for as long as possible, but there comes a time when he decides that the “mission has to succeed” because a starving colony is depending on his expertise. When he finally got around to eating someone, I checked the timer and discovered that I was only about a fourth of the way through the hour-long story. Checking the time in the first place is a bad sign, but I kept listening because I wanted to see what the author had to say that would take another forty minutes. It turns out that most of this length consists of increasingly gruesome descriptions of the main character torturing, mutilating and eating his crew-mates. We are told that the ship isn’t equipped with cold storage (or backup cryopods, for that matter), so the doctor has to keep his victims alive to prevent the meat from spoiling. At first he sedates them, but eventually he runs out of medicine and stops caring. Then he starts taking culinary pleasure in the various body parts he’s eating, and the author goes out of his way to top himself with nauseating details in every paragraph. Ultimately the story is just gratuitous. The basic structure is entirely predictable, so the only thing that makes The Taste of Starlight unique is a grotesque fixation on the particulars of eating a dozen human beings. If the author was trying to make a point about the potential horrors of space travel or the darkness hidden in the human soul, he drives it into the ground and then keeps going. 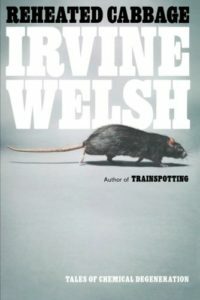 This is the second book I’ve read by Irvine Welsh. The first, Ecstasy, disturbed me to no end back in the day even though I’ve always been a huge fan of the movie version of Trainspotting. Even still, I was willing to give his fiction another chance. None of the stories in this collection are nearly as disturbing, but as with any collection of disparate works, some were better than others. Several of them were fairly modern (read: elliptical) which I don’t always like, but I did like the book enough to keep reading them. I think my favorite of the stories is the last one, “I Am Miami”, which does a good job of sharply drawing a flawed but sympathetic character, and is also the rare example of redemptive themes in the collection. I actually grew to care about the bitter old school teacher at the heart of that story, and worried for his future. My second most favorite was “The State of the Party”, which had several classic moments that juxtaposed Scottish vernacular with crisp, proper narration in a way that made me laugh out loud. I do think that this book is best if you are at least familiar with the world of Trainspotting, simply because two of the stories are directly related to that book in some fashion. It also helps to be able to decipher the written form of Scottish dialect or you will be thoroughly lost through much of the collection. Full disclosure: I received a review copy of this book as part of the LibraryThing Early Reviewers program.